Due to the great competition between companies, Binter Canarias has been forced to lower its prices. 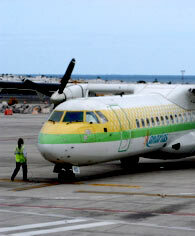 With the objective to continue maintaining the consolidation in the air transport between islands and because of the acceptance of the canarians for other companies, Binter launches new prices, consisting in the reduction of the price in some seats. The fight to obtain some of these seats has caused that we must buy our tickets long beforehand, tickets that have many restrictions such as not being reimbursable although changes are accepted. Binter Canarias has different prices according to the destination, Mini for their shorter destinations - North Tenerife/Las Palmas 38€, or the tourist price of 54€ for the same destination (per way). Or the longest, Hierro/Fuerteventura, with a price which can reach 89€. To cover the need to offer customer service, Binter offers an answers telephone where the company tries to solve the possible problems that can arise.